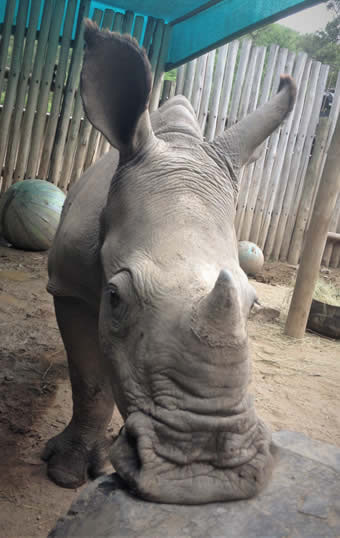 Baby Rhino Jemu at Baby Rhino Rescue | Adopt and Donate Now! This indicated that the mother was dead. A carcass was later found, and assumed to be her mother. Within 30 minutes, a helicopter was on its way. The small calf was darted and airlifted to Care for Wild Rhino Sanctuary. Young rhino orphans will only survive a night or two in the wild before succumbing to stress or predation. Great team effort ensured that this calf had a fighting chance. The rhino calf was named Jemu. She was placed on drips for her first hours at CFW and began to progress well. She took to the bottle in less than 5 hours after arrival and remained calm, settling in quickly. Jemu’s early days were spent mostly drinking milk and sleeping. Jemu didn’t know that a beautiful young alpha was waiting to meet her! Zac had been alone for 4 months and was thrilled when Jemu exited the night pen! It was the proverbial “love at first sight”. They each had things to teach! On their first day together Jemu showed Zac how to eat grass! And on their second day, Zac showed Jemu how to play! As fate would have it another two young rhinos arrived that same week. Zac and Jemu had two days to bond with each other before Grey was introduced and then young Spirit a few days later. Oddly, all the rhinos were exactly the same age, so they bonded quickly and became a tight crash. They live happily in the larger enclosures, which means lots of freedom to graze and play in the big fields all day long, and the comfort of the night pen at night.